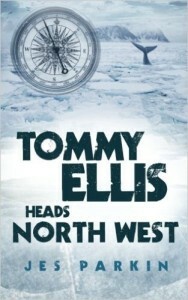 TOMMY ELLIS HEADS NORTHWEST is middle grade fiction but I’m a grandmother, and I learned about the real cost of seafood… and had a vivid experience fishing the Polar Sea. It’s 1960 and Tommy is thirteen now. His father is captain of the Stella Vega, a sidewinder trawler that harvests the northern seas out of England. Tommy gets to spend another summer break on the vessel and he’s feeling like an old hand. Much is familiar, but plenty of trouble waits to wow him, as they plow through treacherous ice, amid bergs towering like skyscrapers. I could hear the quiet, and feel the dense fog on my cheeks; I could see the distinct hues of ancient frozen waters. Color abounds throughout the story, including colorful characters that watch out for the lad but don’t baby him at all. Parkin’s book is well paced, not for lazy or squeamish readers, and highly interesting to those of us who appreciate a little historical reality in our fiction. I can’t wait for my grandson to be old enough for Tommy’s adventures. Buy it here. And PLEASE post a comment after enjoying the story. Reader feedback helps the trilogy of Tommy get discovered!